Emtalks: Benefit They're Real Push-Up Liner: New Launch and Event! Benefit They're Real Push-Up Liner: New Launch and Event! Of course you want to know exactly what happened at Benefit's #benetease event last night in London! Yesterday afternoon I popped to London for a few hours to check out Benefit's latest product launch and I am so excited to tell you all about what we got up to! I also fell in love with the beautiful, down-to-earth Amanda Seyfried, what a lovely girl. My hair is looking particularly shiny on this photograph, I blame my new products from Bumble and Bumble, I washed my hair in the morning using their Creme De Coco range and it's worked wonders on my hair (thank you Bumble, I love having you in my life) - full review coming soon! I wore my new shorts from Zara, they were just randomly on the shop floor and I picked them up, you can get similar here, £18.00 at ASOS and so beautiful, or these gorgeous ones here, £22.00 ASOS, and here, probably the most similar, £20.00. Lastly, I found these ones from MissGuided here which are pretty much the same and only £17.00. I am loving tropical prints at the moment. I paired them with a sequin top from All Saints because it wasn't too warm in London yesterday and I wanted to wear something baggy with them. You can find a similar version of the sequin top here, £12.50 at Mango!, here, £57.00 ASOS (very similar shape) or here, more expensive but quite similar and the All Saints version was £250 after all! My giraffe necklace is obviously from LVNDR! My coat is from a random website ages ago that I can't remember the name of, sorry! Lastly, my shoes! I love these shoes so much but only recently pulled them back out of my wardrobe, you can get the exact ones on Boohoo here. I met up with Hannah Vickers from AwayWithTheFairies, we always get the same train so it works out really well at every event we go to! We had a little wonder around China Town first because we were early, me, early?! I'm never on time! We headed to Leicester Square to find the 'Criminal Facility'. 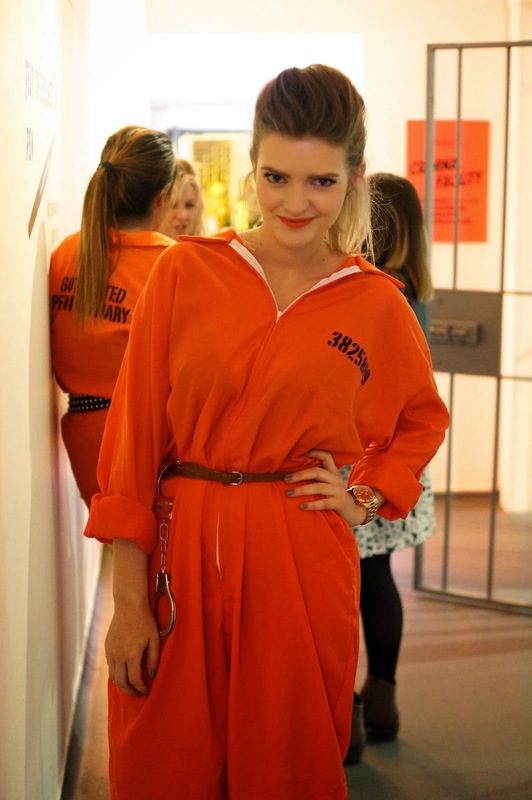 The Benefit staff all looked so good in orange, please can we just appreciate how good Meg looks in orange over-alls?! I haven't seen Meg for years so it was too good to catch up with her! We can't have been too naughty though, because the guards still poured us some prosecco. Now this is a degree that I'd be happy to pay for. We took to our seats and we were taught about the evolution of eye-liner. We were shown videos with girls who had tested this eye-liner yet didn't know what brand it was, we basically went through the whole design and product testing process with Benefit and it really opened my eyes, I didn't realise just how much effort goes into getting a beauty product to the market. But also, it really did make me realise that Benefit are a phenomenal brand when it comes to making their products, they have us, their customers in mind. Introducing, the They're Real Push-Up Liner! It can be applied with one hand (one lady applied it whilst doing the plank in the gym!? ), it doesn't move, its easy to create a cat flick, it's smudge proof, long-lasting, everything you want from an eye liner basically. I'd say it's like a gel-liner but in a pen format, which hopefully and apparently doesn't dry out, hooray! Next Lisa from Benefit ran in with her cell mates as she showed us how to apply it, and how easy it is to apply it. Becca (check out her channel here) looked fabulous as ever. Inside the bag... the ultimate treats, however the pugg phone case belongs to Becca - sorry! Full review coming very soon, but here it is, in the flesh. In true blogger style, everyone was snapping away. Obsessed with Arabella's nails! and the secret was out, as if the They're Real mascara isn't good enough, I'm pleased to introduce you to the They're Real push-up liner, an extremely exciting new innovation from Benefit. However, I couldn't resist getting a snap of Charlotte's gorgeous bag on the way home... (sold at Urban Outfitters here). Nor could I resist eating this gorgeous burger and fries the minute I touched back down near the station. When I arrived back in Leeds, my flat-mate asked me what the product was... when I told her, she actually nearly cried: 'Oh my gosh I want that so much!!!' 'Oh my gosh when is it released!' 'Oh it's amazing' the minute she touched it, she is an eye-liner obsessive and trust me, she knows her stuff when it comes to eye-liners. I cannot wait to give you a full review as I'm actually quite scared of thick black eye-liners, so it will be interesting to see if this product converts me and I'll be using my flat-mates opinions on my review too so that you can have a review from a timid eye-liner user and a full-on eye-liner lover! So over-all, Benefit have wowed me yet again with their phenomenal new product launches and their amazingly caring attitude towards to consumer: ME AND YOU! I am team Benefit all the way. This product is available from mid-June! I love Benefit and this looked like a really fun event. This looks like a great event, and the product sounds amazing too! I'll have to look out for it being released. This looks like such an amazing event, Benefit always seem to come up with such fun ideas. the they're real mascara is such a favorite, i need to try this new liner! thank you for sharing !an amzing event!